Thinking of traveling with your pet this summer? You're not alone. "An estimated 30 million people each year travel with pets," according to BedandBreakfast.com. There's no doubt that our furry, four-legged friends can make excellent traveling companions. But before you load the car or board the plane, you'll want to take some extra precautions to keep your pet safe throughout your adventure together. Whether you are traveling by car or plane you'll want to ensure that your pet is wearing a collar with a sturdy tag containing your name and the phone number you can be reached throughout your trip. You may also want to include your destination city and hotel information, in case you get separated from your pet. It's also a good idea to get your pet microchipped if you haven't already. That way if your pet does get lost and loses his or her collar, the microchip can be scanned to identify your pet and have him or her returned to you. But, even if your dog or cat is microchipped, providing a collar ID is still the best idea. You want to give your pet every chance to be identified and returned to you. Most dogs and cats are safest in a pet carrier specifically designed for their height and weight. While soft carriers will work in a pinch, a rigid, plastic carrier is your best option for safety and security. Be sure to purchase a carrier that allows your pet to comfortably turn around and stand without bumping their head. If you have an existing carrier, be sure to check that the latches are in good repair and close properly before you put your pet inside. As an added precaution, attach a recent picture of your pet and your contact information to your pet's carrier. This is especially helpful if your pet will be traveling in the cargo hold of an airplane or will be left alone in a hotel room. A strong harness and leash are great for larger dogs that will be traveling by car. Be sure to secure your dog properly while the car is in motion to avoid distractions and possible injuries during sudden stops. Prepare a first aid kit to handle minor injuries that includes bandages, gauze, tweezers, cotton balls, an ice pack, a pair of scissors with blunt tips, and a blanket. If you'd like to assemble a more comprehensive kit, check out The Humane Society's first aid kit recommendations. Depending on where you are traveling, it may be necessary to provide a health certificate or proof of recent vaccinations for your pet. You may also want to carry a copy of your pet's medical records in case your pet requires treatment while you are away. Be sure to research regulations concerning pets in the area where you'll be traveling. Depending on the length of your trip or your pet's overall health, it might be a good idea to have your pet checked by your veterinarian before you leave for vacation. This is especially wise if your pet has an ongoing medical condition or requires daily medication. If your pet has never ridden in a car before, you'll want to take your pet out for a few test rides to see how they fare. Make this as pleasant as possible by taking your pet to a park, a pet store, or a friend's house. Increase the duration of the trips over time, until they are used to traveling in the car with you. Dogs usually enjoy car rides, while most cats don't like riding in the car. But every pet is different, so use your best judgement to decide how many test rides you need to get your pet used to car travel. Some pets get car sick. This problem can be compounded if you offer food while the car is moving. Instead, wait until you stop to offer food and water. Be sure to stop every 2 hours or so to allow your pet to eat, drink, stretch and relieve themselves. On a hot day, inside car temperatures can reach well above 120 degrees, even with the windows cracked. In cold weather, your car quickly becomes a refrigerator that subjects your pet to very cold temperatures. Either of these situations is uncomfortable for your pet at best and can be deadly. We recommend avoiding air travel with pets unless your pet is small enough to ride under your seat during the flight. Be sure to check with your airline to find out if your pet can ride in the cabin with you in an approved carrier. Make sure your pet's crate contains the proper identification and attach a picture of your pet in case he or she escapes during the flight. Book direct flights whenever possible. This minimizes the chances that your pet will be left on the tarmac during adverse weather conditions, such as extreme heat or cold. Whether your pet will fly with you or in the cargo hold, don't feed your pet 4 to 6 hours prior to take off. Provide fresh water up until departure. Be sure to research pet-friendly hotels in the area where you'll be staying and plan accordingly. You'll want to find out if you can leave your pet unattended, or must take your pet with you when you go out. Don't assume that recreational parks and beaches always allow pets. Some areas don't allow dogs or only allow them during certain hours of the day or in certain seasons. Be prepared before you go to avoid disappointment. Traveling with your pet can be an enjoyable experience for the whole family. It just takes a bit of preparation and an eye for safety. But the time you spend planning will be well worth the effort, especially when you look back on those vacation photos years from now and relive the adventure all over again. 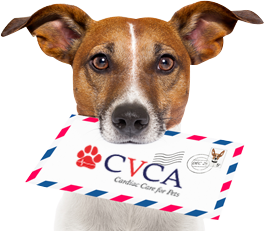 If you have any questions about safely traveling with your pet this summer, CVCA, the leading choice for veterinary cardiology, is always here for you and your pet.